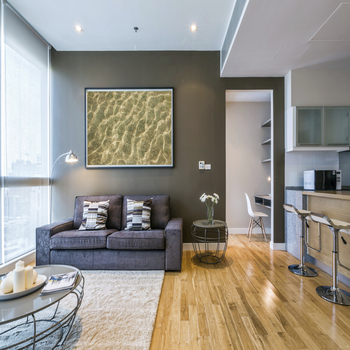 At The City Painters we will work with you to make your condo look its best. We will help you choose colours that will complement the space as well as make it look more open. Furthermore, our professional painters will work hard to make sure that the project is completed as quickly as possible in order to avoid too much disruption. Your team was so fast! I love the way my place looks. I had hear so many horror stories about painters and painting companies so I was very weary when looking for a company to paint my condo. John and the rest of the painting team were so professional and did such a great job. CONTACT US FOR A FREE CONDO PAINTING QUOTE TODAY! Painting your condo prior to sale is a cost-effective way to increase the value of the property, and a great way to help you sell it. Research has shown that staged homes and condos tend to sell faster and for higher prices than those that are not. When choosing your colours, try to stick with neutral colours so that potential buyers will not be distracted from the space if their personalities don’t match yours. Also, by removing wallpaper that is outdated or has distracting designs and applying a fresh coat of paint, you can increase the value of your home substantially. If you don’t want to paint your entire condo, focus on just the high-traffic areas. Make sure the entrance, main hallways and main living area look their best buy applying a fresh coat of paint. These are the areas that potential buyers spend the most time in and are therefore likely to notice any imperfection. Try to paint in neutral colours. While many sellers believe that the buyer will end up re-painting, this is often not the case. Most buyers are looking for a new home that they can move into right away with little to no renovations. If you have rooms which are currently painted bright colours or themed (sports, cartoon characters, etc.) consider re-painting them as these types of rooms are not for everyone and may not match the personalities of your potential buyers. Make sure you paint prior to listing your condo. Potential buyers usually determine if they want to see a property based on the pictures posted. If you paint after listing, make sure that you update the photos in the listing. Know when to hire help. If you’re too busy to paint yourself, consider hiring a painting company to complete the work. If you let them know that your intention is to sell the home, they will usually be able to provide you with cost-saving options.